My Business Name | Today is a day of Firsts! 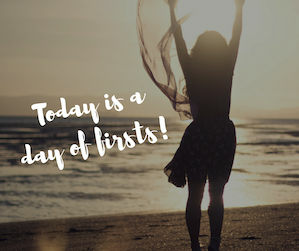 Today is a day of Firsts! Today is a day of firsts. Tomorrow is the five-month anniversary of my ankle break and I took my first real walk since it happened. 4500 steps! Whoopee!! I threw on an ankle brace and went for the gusto. I don't have a class at the Oasis Health Club on Wednesday's and I wanted to keep the calorie burn going. I have to say, I liked the way my ankle looked much better with the brace on then when I tugged it off, but I am making progress. Only two months ago I was at the Urgent Care in Chardon, Ohio. I'd forgotten about it until I saw the $661.00 bill. I had to sift through my stacks of medical bills to figure out, if, and when, I was treated there. I was reminded that I had the second raging infection in my sutures that refused to heal in September. The orthopedic consultant on duty said that if he was still practicing he would take me into surgery right then and remove the plate in my ankle. He was afraid that the infection might have gone into the bone. Let me tell you; we were praying hard when we left the hospital. God answered. My twelve week follow up x-rays looked good. I healed up and didn't need to see another orthopedic when we got to Niagara Falls. The plate and seven pins are still there. I have so much to share about how my ankle break played out. I decided on the name of my future book on my walk this morning, "He Didn't Push Me Over, But He Let Me Fall - How God used a broken ankle to change my life." I'd love to hear what you think of the title. I sold Johnny's Bar & Grill to Pete Lago over seven months ago, and I haven't walked through the doors since. It was just too weird for me. That, and I was away from home and on the road for months. I gave over 22 years of my life to the business. Returning to it when it wasn't mine anymore was something I hadn't felt I was ready to handle. Today that changes. My good friends Teresa, (the lovely woman who took such good care of our home while we were gone) and an old friend from Johnny's, Robert, are taking me there for a visit. We are stopping in at Johnny's on the way to the Ale House for a Paint Party. I sure I hope get to see my old friend Chuck. He's the owner of Grilling and Chilling Ale House and he was always so supportive of me when I owned Johnny's. Seeing the my old bar for the first time in over seven months is going to be strange. I'm pretty sure I won't know the bartender. I'm hoping that Jeana will be back behind the bar at 5:00 like in the old days so I can give her a hug. I may even have to let her make me a Purple Hooter. I haven't had a shot of alcohol in months so it could make me a little skippy. I've enjoyed a beer or some wine but I left shots in the rear view mirror when I left Johnny's. God is good, and He has blessed me beyond belief. I'm embarking on my codependency coaching career and plan on writing lots of books. I'm excited to be experiencing life after Johnny's. I'm even cooking the Thanksgiving Day dinner which I haven't done in more years than I can remember. Some friends that were a huge part of life at Johnny's in the beginning, the Frisbee's and the Uhauld's, are coming to town for a wedding and will be here for Turkey Day. The last time we enjoyed a Thanksgiving Day meal together was when I fixed it at Johnny's Bar & Grill. For years I fixed a free dinner for people who had no place to go. I always "put on the dog" so it was a ton of work. Thank you, Jesus, I'm done with that. The burn out was so bad that even when the bar was closed on Thanksgiving, I didn't want to cook. The Wednesday Karaoke before Thanksgiving at Johnny's was always a ball buster and all I wanted to do on Thanksgiving day was sleep and watch football. Wow, have things changed. The transition has been huge! 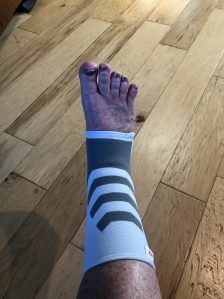 It will sound strange until you read my story but the broken ankle even played into making the transition easier. The Lord works in mysterious ways. Many times you have no clue why God lets things happen until long after they take place. He had a purpose for everything that has happened all along. Things are going just the way He had planned, not my way. God's ways are always better than your ways. Take my word for it.